As a rampart against the ISIS, the Kurdistan Regional Government (KRG) is backed by the international community in its fight against terrorism; however, the Kurdish authority represses dissenting voices. According to a report by the French newspaper Liberation, after ISIS advanced on the borders of Iraqi Kurdistan in 2014, the international coalition strengthened its collaboration with the authorities of Erbil, the Kurdish capital, which has become an essential partner in the war against terrorism, being the obligatory passage of diplomats, humanitarian activists and journalists since, especially at the time of Mosul battle. Meanwhile, the regression of civil freedoms in this autonomous region has been far from being a concern for all these foreigners. During a recent visit to Arbil, François Hollande, the President of France, spoke of “the values of freedom, respect and human dignity”, saying that he was honoured by the collaboration between France and Iraqi Kurdistan against terrorism; a speech addressed to the Kurdish “President” Masoud Barzani, whom Paris welcomed with great pomp on February 21 at the Élysée Palace. Barzani is a “president” whose second term has ended a year and a half ago, calling into question the legitimacy of his elected assembly; a “president” in whose name the freedoms of the Iraqi Kurds are repressed. Meanwhile, behind the front, a part of the Kurdish population demands its basic human rights: Access to electricity, water, and a decent wage. Some protesters, like Soran, call for taking up arms. Others no longer dare to protest after having received a number of death threats and having seen their friends arrested by the security forces and then fleeing to Europe without a word. 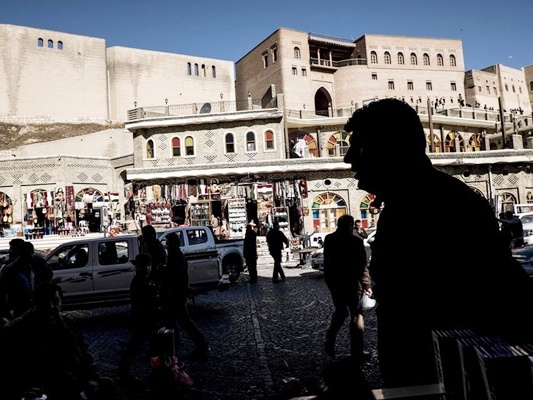 “The fashionable Kurdish speeches on democracy … are only duplicitous market goods, successfully sold to Western countries,” said Aras Fatah, Kurdish sociologist and journalist.